Regardless of whether your customer is a business, apartment complex, warehouse facility, school, hotel, or medical office, physical security and facility access are important. Most businesses need a device that tracks, manages, monitors, and restricts access to a physical building. The Grandstream GDS series of IP Door Systems will be a security game-changer for any customer. These devices provide access and security to buildings through a built-in intercom, IP video surveillance camera, keyless entry, and other state-of-the-art features. The main functionality of the GDS Series is to track and manage access to rooms and facilities. The GDS device utilizes RFID cards and fobs, as well as PIN codes, to allow access into secured areas. When paired with the free GDS management software (GDS Manager), administrators can create and manage these RFID permissions. Admins can also set time rules and schedules, as well as track any and all activity. The GDS3710 also acts as a powerful audio and video intercom when paired with any of Grandstream’s IP voice and video telephony solutions. The camera on the GDS3710 features a 180-degree hemispheric camera, which allows the device to act as a security gatekeeper. Video from the GDS3710 can be viewed by any admin who it utilizing the free GDS Manager software. Weather is unpredictable and needs to be a consideration when choosing any device that may be utilized outdoors. The GDS series was built with weatherproof and vandal resistant casing, protecting it in any weather condition and environment. The devices perform optimally in temperatures ranging from -30 degrees Celsius to 60 degrees Celsius. Which GDS Model is best for your customer? Before choosing a GDS model, one must determine whether the device needs to have video and audio or just video. If your customer needs their access device to act as a surveillance camera, the GDS3710 is the right choice. This IP Video Door System not only serves as an intercom but also as an HD IP surveillance camera. It features a built-in 180 degree, 1080p HD hemispheric camera, built-in RFID chip reader, built-in microphone and speaker, and alarm-in/alarm-out support for integration with existing security devices. Video is crisp and clear even during the evening and nighttime hours thanks to the white LEDs with smart brightness control. The casing is made out of zinc alloy aluminum, making it weatherproof and vandal-resistant. If your customer is in the market for an audio-only device, the upcoming GDS3705 is the top choice. This strong audio-only access and monitoring solution is great for any size deployment. 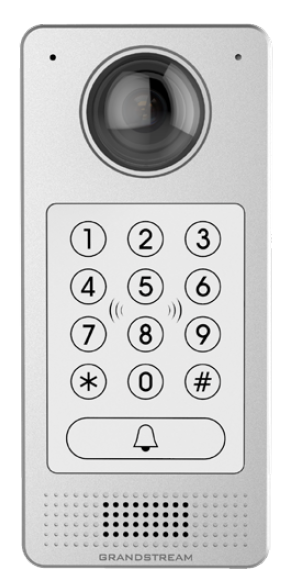 The system offers intercom functionality, as well as secured keyless or key entry. It comes equipped with weatherproof and vandal resistant zinc alloy metal casing and also features alarm-in/alarm-out integration. By integrating the GDS series with other Grandstream solutions, your customers can build powerful facility access management solutions. The integration allows the GDS series to alert Grandstream IP phones through SIP calls when certain security events occur, such as motion is detected on the GDS3710. The GXV Series IP Video Phones for Android™ work as a video intercom with the GDS3710. The 7″ 1024×600 touchscreen is ideal for watching live video feed from the intercom. The GXV phone can also receive calls from and place calls to the GDS devices, open doors with one touch, and receive security alerts. For both audio and video, there is a GXP high-end IP phone that works flawlessly. These phones act as an audio intercom with any of the GDS devices, while the GXP21XX can receive video snapshots from the GDS3710. Like the Android Video Phones, the GXP phones can also open doors with one touch and receive security alerts. Mobile solutions also work with the GDS devices. 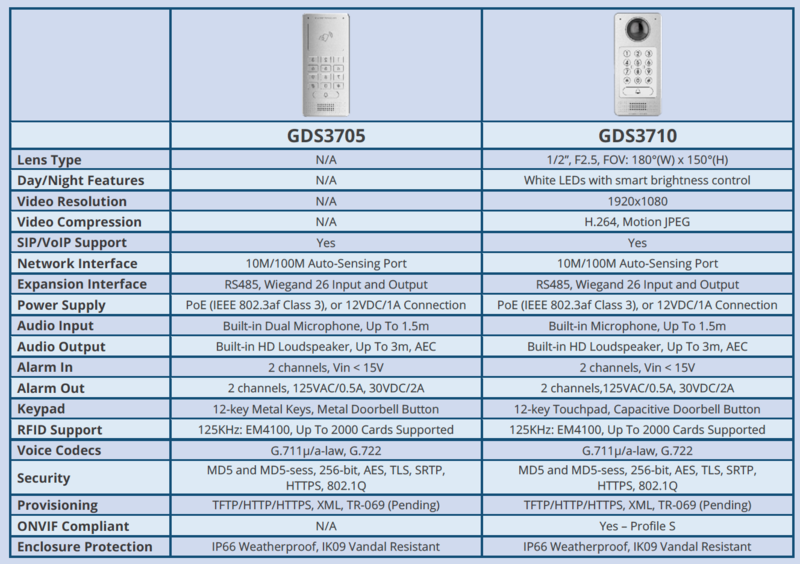 The WP Series (WiFi) and DP Series (DECT) Cordless IP phones work as an audio intercom with GDS. They also offer wireless control of the GDS, open doors with one key, and receive security alerts. For those who prefer to utilize their smartphone, users can download the Grandstream Wave Softphone app. This app allows your own device to work as an audio and video intercom. It also possesses the same capabilities as the other compatible Grandstream devices. Get more from your GDS Door System by pairing it with complementary accessories (purchased separately). USB RFID Card Reader: This compact, sleek card reader can be installed anywhere. Connect the reader via USB to a computer running the GDS Manager software and you can easily track, monitor, and manage all reader activity. RFID Card: These non-writable proximity induction cards are easy to set up and even easier to use. In-Wall Mounting Kit: This in-wall mounting kit offers a flush mount within a wall rather than on the surface of a wall. It supports solid wall, stud, and drywall installation and should be installed with the bottom of the device at least 50-55″ above ground. Grandstream’s GDS Series will exceed your customers’ expectations of a Video or Audio Door Phone. 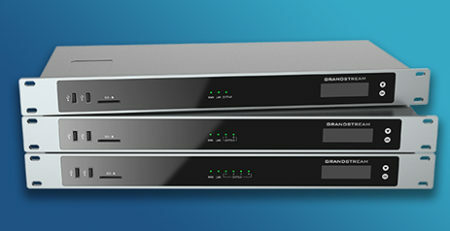 To learn more about the series and other Grandstream solutions, contact 888VoIP at 888-864-7786. Your dedicated Account Manager can educate you further on these devices, as well as Grandstream’s upcoming GDS3705 and WP802 WiFi Cordless IP Phone.